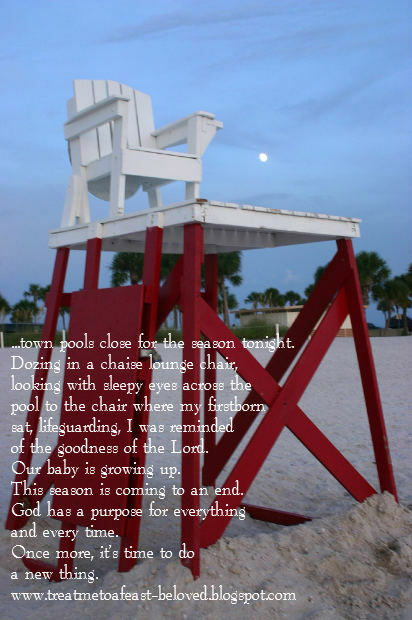 Our town pools close for the season tonight. As I dozed in a chaise lounge chair, looking with sleepy eyes across the pool to the chair where my firstborn sat, lifeguarding, I was reminded of the goodness of the Lord. Our baby is growing up. This season (both literally and figuratively) is coming to an end. God has a purpose for everything and every time. Once more, it’s time to do a new thing. School begins in just a few days, and while they are returning to the same schools, they are changed. There will be new challenges. There will be new hurdles to overcome. There will be successes. Heartbreak may come. I am thankful that God gave us charge over these two incredible souls. My beloved and I take this obligations seriously, reminding them when necessary that we’d rather they be mad at us then risk grieving the heart of God by not raising them according to His Will for their lives. They don’t always like it; they are learning to understand. Gazing at my girl with heavy lidded eyes, I saw the three year old with the big smile for just a moment before the vision faded. She will always be that girl for me--fearless, fierce, and oh so loveable. She was a warrior from the very first moment I knew her. Scanning to my right, I saw her little brother (not little by much) playing in the pool, muscled, athletic, carefree. The world may not always embrace them as it did this day. Thank God they are shadowed beneath His Wing, even when I’m not around. I am not sad; summer can go. I realize it’s only the unofficial end of the season, but in my heart I’ve turned the page. No more late nights; it’s time for the discipline of regular evening routines (we no longer call them bedtimes). My babies grow; my prayers are answered. I have reached the point in my life where there may be as much behind as there is to come (God willing…). I have enjoyed a number of simple pleasures, each teaching me a lesson in gratitude I am thankful to have learned. Once again it’s time to do a new thing, and that I am uncertain what that new thing might be is an uncertainty I embrace with joy. I am braced for brilliance. I welcome the new, honor what was, dance in the now. It’s all good. It’s all God. God is good.